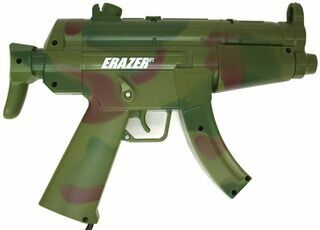 The Erazer MP5, known as the Erazer Gun in Japan, is a light gun compatible with both the Sega Saturn and PlayStation. Its origins are currently unknown, however it was distributed by Blaze in Europe and Gametech in Japan. As the name implies, the Erazer MP5 is modeled after the Heckler and Koch MP5 submachine gun. Two versions of the Erazer are known to exist, one in black, and one with a green/brown camouflage texture.